The Star Sports Backpack has been created by Star Group Sports Inc. 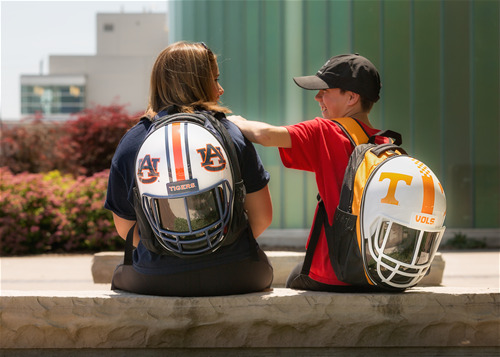 This unique hard-shelled backpack has many cool features, and is an officially licensed NCAA product. It is the Winner of 2 Product of the Year Awards, with Creative Child Magazine, has been featured on Sports Illustrated for Kids, and is a must-have product. It weighs only 2 pounds, has standard backpack features, 2 water bottle pockets and contains 2 compartments. It can hold many different items and has alot of room for books, pens, pencils, a lunchbox compartment. It has an extra - padded back and comfortable adjustable straps. 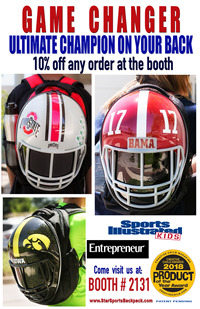 We also do custom orders for corporate, teams, schools, fundraisers, etc.